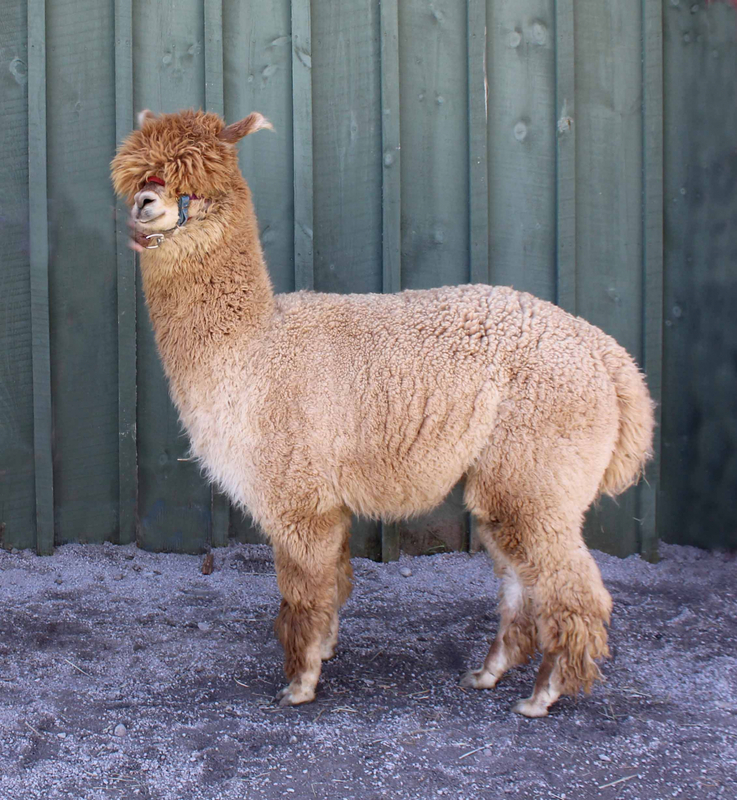 As this year comes to a close we are preparing to celebrate 10 years of alpaca farming at Oak Hills. When I reflect on those 10 years, and how a rolling lawn became a farm, I recall a series of back yard miracles that happened along the way. 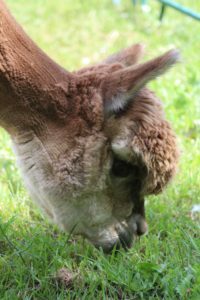 Is alpaca farming work? You bet. But if you are dedicated to what you do it’s not hard work. And there are moments that will simply take your breath away! 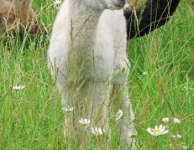 I will begin where you might expect me to begin, with the birth of cria, or the beginning of life. You may have seen videos of these births on the internet. And I don’t know about you, but I would characterize them more as messy and stressful, but hardly “miracle” material. The miracle begins not just months, but a year before as you pour over pedigrees, and stand at the fence watching the potential sire and dam’s every movement to analyze body styles and other traits. You make that decision, make the match, and then you wait, and wait, and wait. 345 days, more or less. And by the time you have just about forgotten about what’s going to happen, you pass by the pasture and notice some tiny ears sticking up in the grass, or the kids come running up from the barn to scream that, “something’s happening” or “someone’s arrived”. And it might happen while you are on a business teleconference, or baking cookies, but next thing you know, your herd has grown by one. And whatever you had planned for that day gets pushed aside to allow for hours of admiring that new life, and all the firsts that come with it: standing, nursing, bonding with mom, and finally touring around the pasture as if it were not the first day it did such a thing, let alone the first day of its life! Yes, that new life is a miracle, but how it changes your day, and slows your pace, and fills your heart with pure joy – well that makes every sub-zero trip to the barn worthwhile! All’s well that ends well. Avicii’s arrival and attentive dam. Alpacas are amazing. They make a 345 day job look simple as it comes to an end. Most births are completely uneventful and quick. It’s incredible. But the few tough births are those that really illustrate the miracle of life. In 10 years we have had only one birth that required vet assistance. 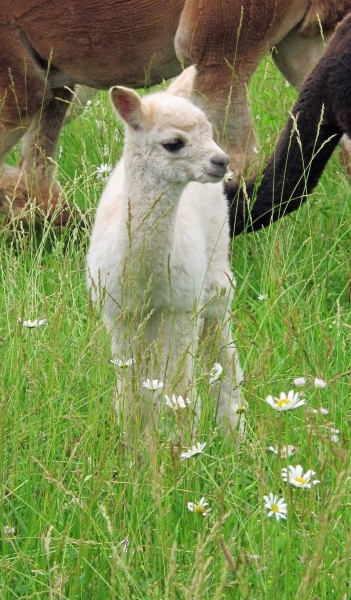 As I stood watching a partially delivered cria gasping its first breaths of air, I have never felt so helpless. I thought that at any moment it could draw its last breath. And I had no idea how to assist. Within 20 minutes that vet was on site, and with some simple repositioning of a leg, that baby slipped right out and the dam finally got a well-deserved rest. With a quick wash up and a wave as he left, the vet was gone. But my gratitude continues to today. His simple, “all in a day’s work”, made our year. We will always look at “Avicii” (as we named him), as something a little bit special. 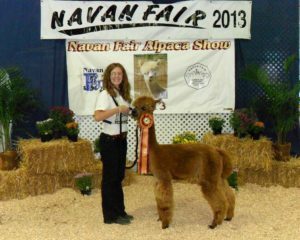 Best in Show at Navan Fair! There are also times when those births deliver miracles a little further down the road. 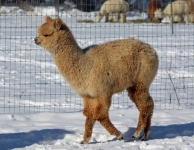 We began our alpaca farm by purchasing a liquidation herd of what you would call basic hobby farm stock. It was our intention to “breed up” as we could afford to do that. In that group were two yearlings, one male and one female, that we were particularly proud of and couldn’t wait to breed together in a few years when they were ready. Two years later we did that. Three years later a lovely little cria arrived. 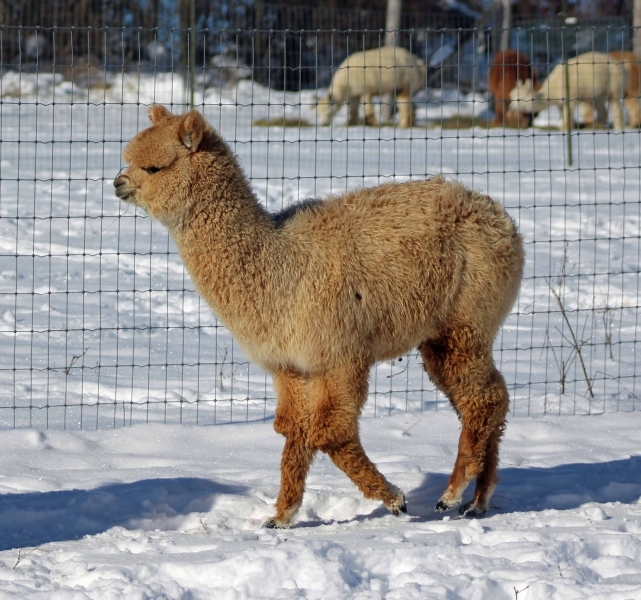 Many new alpaca farmers are “barn blind” and think their alpacas are something special. We were no different. She was lovely. We proudly took her to Navan Fair a year later, as a yearling. And when that judge called me forward to accept the “Best in Show” Ribbon, no one was more shocked than me. I truly thought I was being excused from the ring rather than being honored. A miracle! 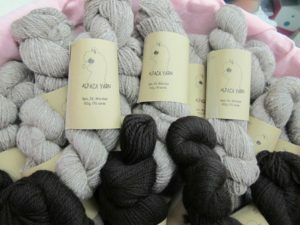 Alpaca fibre is a miracle in and of itself. 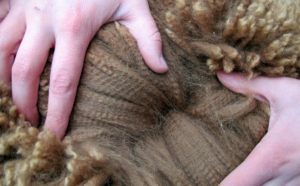 Any of us that have touched it, or worked with it, know what the Incan Dynasty knew many centuries ago – it’s the “fibre of the gods”, fit for royalty only. 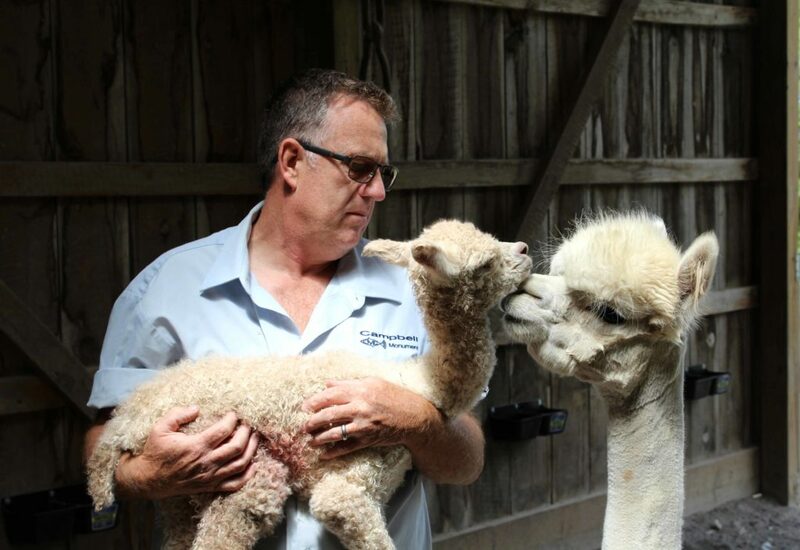 But in your backyard, you witness the miracle of that fibre appearing on a newborn cria, and then watching as that first shearing reveals something just a little different and more beautiful still. You marvel at the tiny little creature that was hidden under all that fibre. And then each time you take a moment at the barn to part that fleece and take a look over the next year you are once again amazed at what you find. A miracle to be harvested on the next shearing day. Once shearing day is over, the fleece is placed on the skirting table and we go to work skirting and sorting it. And as the bits fall away in the wind, the birds are there to collect it and feather their nests. A miraculously soft bed for those new little hatchlings. Colourful skeins of yarn are produced by the mill. 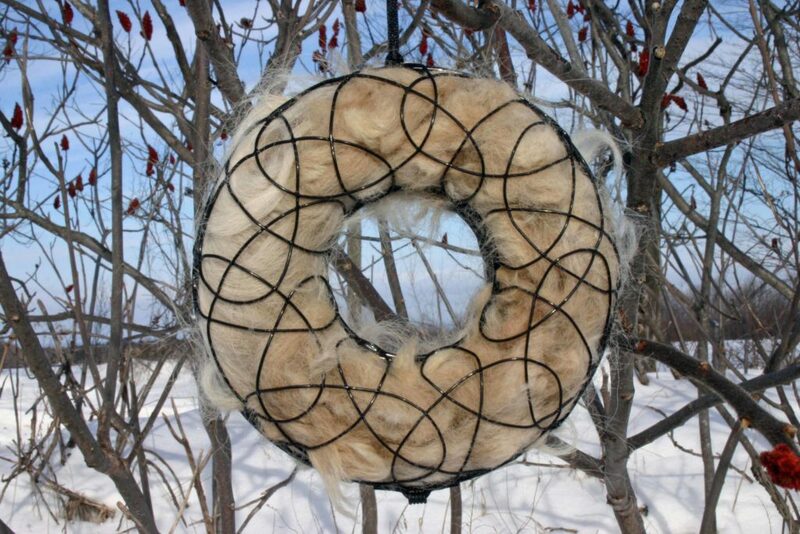 What comes next, when fibre leaves your farm for processing and then returns, is another little miracle that can only truly be appreciated by a fibre artist. The skeins of yarn that return from the mill bring the rainbow of colours in the field back to life, and place them in the hands of fibre artists to create more miracles yet again. 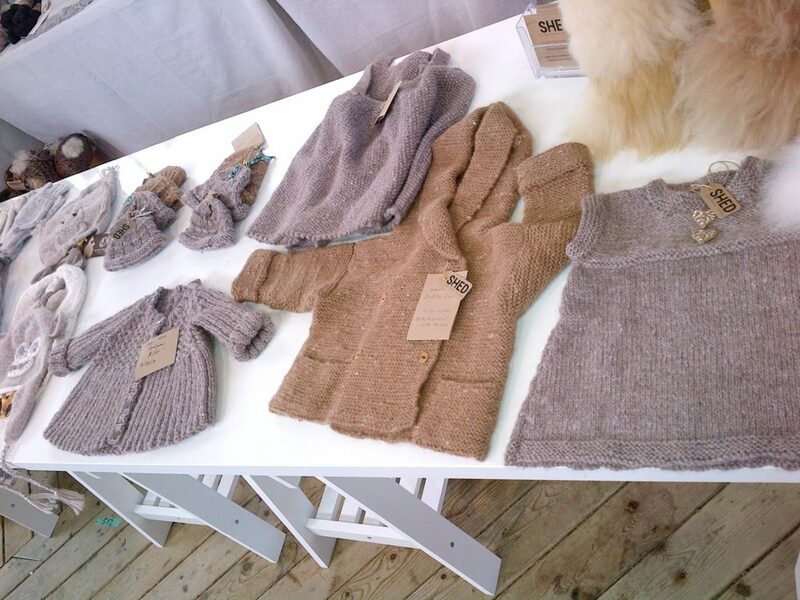 Fabulous fibre becomes beautiful products. 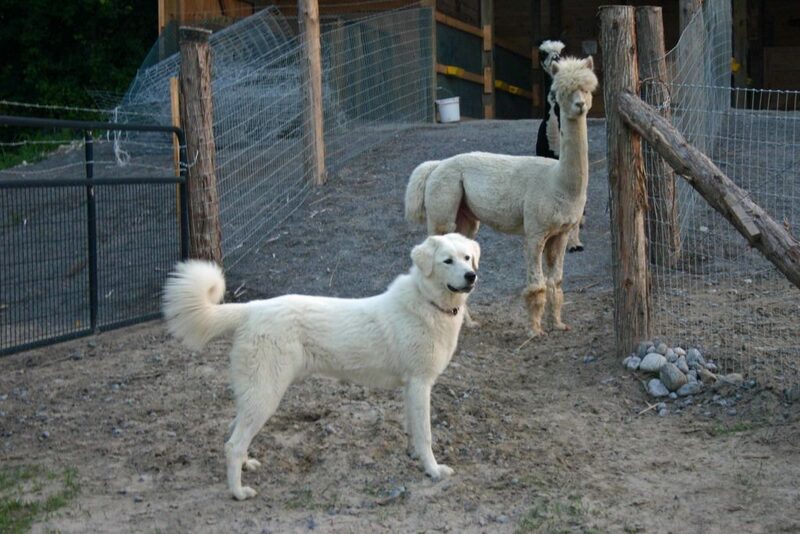 On our farm, a livestock guardian dog has always kept watch, keeping the balance in the field. It is amazing to watch as a young pup grows into an adult and those instincts kick in. When your first cria arrive you rarely sleep on those summer nights when the coyotes howl. But as those dogs learn their job, not a coyote for miles would come near the herd – a herd that is now that dog’s herd. It’s amazing how one canine protects the herd from another canine, and the farmer rests. Livestock guardian dogs’ instincts miraculously kick in. The alpacas themselves are a miracle, but so too are the people. Since starting the farm, and promoting our breeding business, customers just suddenly arrive. 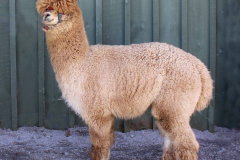 Little warning – just a call when they finally are ready to make that move and visit a farm to see what alpaca farming is all about. These strangers arrive, spend some time with us (sometimes days, sometimes years), suddenly they are friends, and then just as suddenly they are alpaca farmers. We visit them over the months and years to follow, and watch their own miracles unfold. What an honor. Also, people seem to come when you need them. Neighbours are drawn to the barn that might never have crossed the property line otherwise. The miracle of friendship is incredible, and the miracle of family is unmatched. We have watched 10 shearing days come and go, and without fail, over 20 friends and family arrive to volunteer their day to make our load lighter. And when a health crisis lands on our doorstep and we find ourselves swept away in a world of hospitals and doctors, we have been able to forget the farm and focus on the miracle of healing while friends and family pick up right where we left off until we can get back to the farm again. A miracle. Toys become tools – a miracle! We are appreciating the miracle that is our natural environment more and more with each generation. 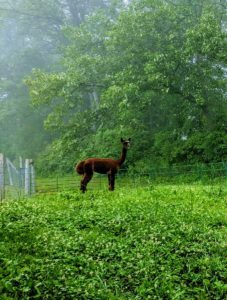 Farming alpacas in your backyard brings you closer to nature, and face to face with those miracles. As farmers, we have the ability to build the very soil our herd depends on for its summer nourishment. Now call it a toy, or call it a miracle. 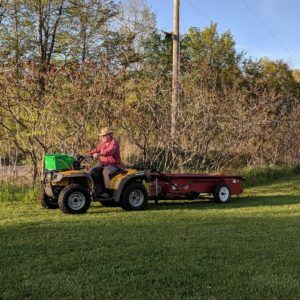 But the purchase of a mini manure spreader has seen my husband happily loading our small pile of manure into the spreader, and adding nutrients to the soil of every pasture and all our lawns. The grass is a little thicker, and a little greener. And rather than depleting the soil, we are now improving the land in our care. I think my husband would say that with farming, toys become tools. There’s a reason to have them. No argument from me. And for him that’s a miracle! Nature delivers miracles to your backyard everyday that you often don’t take time to notice, creating spectacles from rainbows to snowdrifts. Grass dies, then rallies to grow, nourishing the alpacas for months on end. And bitterly cold days that leave icicles on our nose fail to penetrate the warm blankets of fleece that insulate each alpaca. Some miracles happen in the quiet moments. The therapeutic, almost hypnotic hum of the herd in the barn as they talk to one another while all else is quiet. When time permits, we will take a comfy chair out to the pasture, or just sit right down right on the ground and watch the herd graze. I often have a camera in hand. The photographs that come to life after an afternoon spent that way can often be amazing. Alpacas are beautiful in a way you sometimes don’t appreciate until you see them captured in a photograph. And that view out the back window, that changes every day, hour by hour, that rivals any masterpiece that’s been created over the centuries – a miracle! Ten years later, the best part is that our next 10 years will deliver another series of backyard miracles that we can’t even begin to imagine. Originally published in the December 2018 issue of Camelid Quarterly. A special thanks to the editors for their permission to reprint.